Published: Dec. 11, 2016 at 11:23 p.m. Updated: Dec. 12, 2016 at 07:58 p.m. Despite touching the ball just twice, J.J. Nelson scored two touchdowns. He was only on the field for 19 plays in total. If there was ever something that screamed "do not chase," it is this. Michael Floyd was out on a team-high 98 percent of the team's plays, but as it's been all season, that was not enough to get him to produce. The rainy conditions in this game were likely a factor in what caused Larry Fitzgerald's floor to come crashing down, despite seeing his normal target and snap volume. With Julio Jones out, small speedsters Aldrick Robinson and Taylor Gabriel split the rights to lead the team in targets. Robinson led the team while playing on 86 percent of the team snaps, while Gabriel was out there for 78 percent. Justin Hardy was the team's primary slot receiver, taking 48 percent of his plays from the interior. Nick Williams also took all seven of his plays from the slot, and was targeted five times. This was somewhat significant given how close those two numbers are to each other. He's all the way back now, as Sammy Watkins went out for 94 percent of the Bills' offensive plays against the Steelers. He also scored a red-zone touchdown. There are no more concerns with Watkins' playing time, and he is an every-week high-end wide receiver candidate as long as he is healthy. Robert Woods, in his first game back, only went out for 50 percent of the team's plays. He was a solid fill-in early in the year, but has a long road to travel to relevancy with Watkins back in there. After losing some playing time last week, Kelvin Benjamin led the team in wide receiver playing time. However, the Panthers are still employing some sort of rotation, as he played on just 76 percent of the team's plays. Devin Funchess still plays fewer than 40 percent of the snaps per game, making him impossible to project on a weekly basis. It was nice to see Greg Olsen, you know, produce something. The volume finally turned into production for Cameron Meredith. He has target totals of nine, four and eight in Matt Barkley's three starts. However, Alshon Jeffery is set to return from his suspension in Week 15. It remains to be seen how new quarterback Matt Barkley gels with what should be his best receiver, but if logic prevails, he should lead the team in targets the rest of the way. Rather predictably, the Bengals did not need to take to the air much to beat the Browns. They gained an early lead, and handed the ball to a running back 34 times compared to just 28 pass attempts on the day. That's likely the reason that Tyler Boyd played on just 58 percent of the snaps, despite tying for the team-lead in targets with six. Boyd needs volume to reach any sort of upside numbers as long as he's going to carry the 5.5 average depth of target. The good news is that next week's game with Pittsburgh looks like a contest that might force the Bengals to take to the air more. Here on Monday morning the prevailing question as to why the Browns started Robert Griffin III is "what was the point of that?" Griffin completed just 48 percent of his aimed throws on Sunday, per Pro Football Focus, fourth-worst mark of the week heading into Monday Night Football. The plan with Griffin appeared to be: hold the ball forever and fling it as far as you can to Corey Coleman and Terrelle Pryor, which Next Gen Stats helps put into context. Griffin averaged 11.2 air yards per attempt but just 3.5 air yards per completion. His -7.7 differential was the worst of Week 14. Griffin has the longest time to throw of any quarterback in Week 14 with 3.31 seconds, but registered just a 16.4 passer rating on throws where he waited 2.5 secs to throw. Yes, Griffin threw the ball deep as he had three passes that traveled 35 yards or more in the air. Yet, none of them were completed and one was intercepted. The Browns wideouts may struggle to produce if Cleveland continues to run out Griffin as the starter. This was likely Dak Prescott's worst game as a pro, and it was also a bad time for Dez Bryant to miss some plays. The snap and target counts remained mostly the same for Dallas, so as long as the passing players get back on track individually, there is no reason to project them differently next week. It's always the same situation with the Broncos. This is the most highly-concentrated offense in the NFL, with Emmanuel Sanders and Demaryius Thomas handling 57.7 percent of the team's targets. We shouldn't be too surprised the duo smashed the Titans secondary, as a number of wideouts have done just that of late. Golden Tate has double-digit targets in back-to-back games in Weeks 13 and 14. This past one came with Marvin Jones returning to the lineup and assuming an 83 percent snap share. While the target distribution has been spread out this year, it's worth noting that Tate does appear to have what most resembles a lead. Speaking of consistent role, that's exactly what Anquan Boldin has. Over the last four weeks he leads the team with a healthy eight red-zone targets. The Packers distribution is consistent and predictable, at this point, and we should expect that going forward the players who lead this team will do so every week. Jared Cook did suffer an injury in this contest, so he may miss time. Ty Montgomery played on 51 percent of the team snaps and was in the backfield on all but four plays. That's his role going forward. Same old song and dance with the Brock Osweiler-led Texans. If you were expecting something different at this point, you must not have been paying attention. In what was a prime setup coming in, Donte Moncrief has not been able to capture much momentum due to some bad luck. He left this game before its conclusion with a hamstring injury after missing a long stretch with a shoulder issue. Phillip Dorsett got eight targets in relief of Moncrief, and turned in 19 yards. We're not chasing Dorsett anymore. Distribution remains something of a constant with the Jaguars, other than Allen Robinson's volume predictably cratering. Xavier Rhodes shadowed Robinson in coverage on 22 passing plays in Week 14, and was he targeted just twice. He's shut down several receivers this year, and Robinson became his latest victim. Not much changed for the two key cogs of the Chiefs passing game with Jeremy Maclin back. Travis Kelce was once again the focal point of the aerial attack, absorbing 33.3 percent of the team targets and going over 100 yards receiving for the fourth-straight game. Tyreek Hill continued to operate as the No. 2 receiver, going out on 44 percent of the offensive plays. However, because the Chiefs design touches for him and he's a dangerous deep threat, the lack of playing time does not hurt his outlook. With the Chiefs rolling and set to make a playoff run, there's little reason to assume they shake up their approach. With Jeff Fisher relieved of his coaching duties Monday afternoon, there's a chance that the distribution is altered somewhat. However, for now, it appears that only Tavon Austin and Kenny Britt will see requisite volume to produce on this bad offense. Lance Kendricks' target totals have gone down from seven to five to three over the last three weeks. DeVante Parker and Jarvis Landry were both on the field for 96 percent of the team's plays, and Kenny Stills was right behind them at 95 percent. According to Next Gen Stats, shutdown corner Patrick Peterson only shadowed DeVante Parker for seven passing plays. He's still an inconsistent player. Stefon Diggs' slot usage was slightly down, as he was inside for just 64 percent of his plays and saw three of his five targets while lined up outside. Adam Thielen remains a consistent factor in the offense. He has a team-high 305 receiving yards and is second on the team in targets (30) over the last month. Brandon Coleman took over Michael Thomas' spot with the rookie missing this game. He played 84 percent of the snaps, just one fewer than Brandin Cooks. There was no edge in red-zone work, as five players all had one target on the day. Coby Fleener, despite Josh Hill's season-ending injury, remains a non-factor. Odell Beckham is the only part of the Giants' offense that is truly working right now. He had 32.1 percent of the team targets and 60.8 percent of Eli Manning's intended air yards. No other player on the Giants checked in with more than four targets. Victor Cruz was on the field for 72 percent of the team's plays, which was up from last week, but only saw three targets and dropped one of them. Robby Anderson now has over 36 percent of Bryce Petty's targets the last two weeks. He accounted for over 66 percent of Petty's intended air yards in Week 13 and checked in with another massive figure at 51.6 percent against the 49ers this week. At this point, it's clear to see who the new quarterback's favorite target is. He's a player with a high ceiling as a deep threat. Anderson has a 21.1 average depth of target the last two weeks. Marshall does not appear to be a priority target for Petty, or perhaps teams are making an extra effort to erase him. He accounted for just 12.6 percent of Petty's intended air yards. Derek Carr offered up one of the worst quarterback performances of the year on Sunday, and his receivers sure didn't help. Miscues when catching the ball and struggling to get open were problems all game long. The distribution was much the same as ever, but the production was a far cry from what we're used to. We shall chalk this up to an outlier and hope we don't see any more performances like this from the Raiders passing game again. Carson Wentz threw "just" 46 passes after attempting 60 passes in Week 14. Trey Burton popping up for a season-high 10 targets was interesting, especially as he collected nine targets last week. Burton was on the field for 46 percent of the team's plays, and it's quite possible the team will look to keep him as an ancillary piece, at least. With the team's struggles with health and underperformance at wide receiver, this is may be a sign they will use more two-tight end packages going forward. A week after seeing the incredibly high ceiling of Ladarius Green, today we got a glimpse of the floor that still exists. Green only went out for 38 percent of the offensive plays, and as long as that's a part of his utilization plan, there's some risk of him putting up slower stat lines. However, we can easily chalk this up to the passing game overall not doing much in the snow. The Steelers threw 31 passes to 38 runs from Le'Veon Bell. The Chargers passing game hasn't been the same of late, especially with Philip Rivers throwing seven interceptions over the last three games. However, Dontrelle Inman has carved out a steady role as the possession receiver. He had an average depth of target of 9.9, whereas Tyrell Williams (39.2) and Travis Benjamin (28.3) were used much farther down the field. At this point, we can view his place in this offense with a strong amount of certainty. Jeremy Kerley led the team in targets in his sneaky revenge game. Tight end Vance McDonald, who was fresh off a contract enxtension, was ruled out early in this game with a shoulder injury. He was establishing himself as a top target for Colin Kaepernick with eight and four targets in the two games before Week 14, and six in every game from Week 7 to 11. The Seahawks offense seems to be on an every-other-week plan in terms of actually playing well. Their home/road splits are also getting a bit more drastic in the second half of the season, though, that could easily just be noise. Tyler Lockett and Jermaine Kearse are essentially splitting the No. 2 receiver duties with identical target totals. Lockett played on 61 percent of the snaps and Kearse 75 percent. If you're interested in chasing the Buccaneers opening at wide receiver with Cecil Shorts done for the year, the snap counts were pretty clear who the new likely No. 2 is. Russell Shepard trailed only Mike Evans by playing 67 percent of the snaps. Josh Huff was also elevated from the practice squad to provide relief with Adam Humphries out with a concussion. He played on 41 percent of the team's snaps and was lined up in the slot on 81 percent of his plays. The Titans were suffocated by the Denver secondary. Marcus Mariota completed just six of his 20 passes, and the running game ruled the day. The only player in the Tennessee passing game that could have been projected for any modicum of success was Delanie Walker. 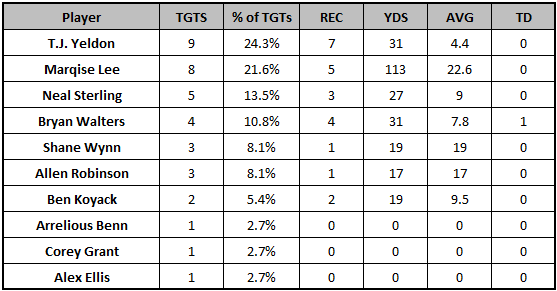 Wide receivers just never get any separation or production against the Broncos. Unfortunately, even Walker could not find much success at all today, either. 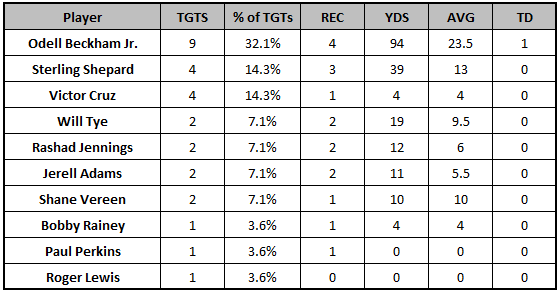 Pierre Garcon tied with DeSean Jackson for the team-high mark in play participation, going out for 87 percent. Jackson is the bigger name and the emergence of Jamison Crowder has been legitimate, Garcon will never get the buzz the others do. However, as long as he's on the field this much in an offense that is one of the best in the NFL, he's a solid option to produce. Jordan Reed returned after missing last week with a shoulder injury, but only went out for nine total plays. That's a tough pill to swallow. Hopefully he'll be able to play a full complement of snaps in Week 15.